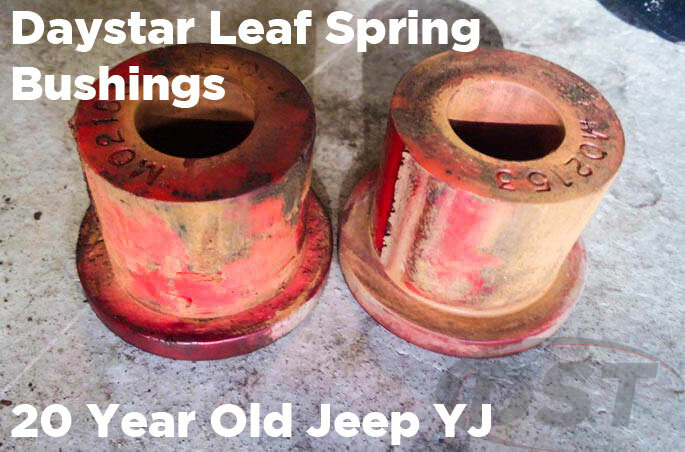 Daystar's Leaf Spring Shackle Bushings will strengthen the connection between the springs, shackles, and frame, much better than original rubber bushings, maintaining secure axle alignment and improving handling. Find the shackle bushings for your vehicle below. ...polyurethane shackle bushings from Daystar are more durable than the original rubber bushings and can handle the shape-changing stress that your truck or SUV produces. If you're looking to upgrade your leaf spring suspension to better take on rougher trails or heavier payloads then replacing the original rubber bushings in the shackles is a good first step. Rubber bushings do offer a smooth ride but when you're rock crawling in your Jeep or hauling a ton of cattle cubes in the bed of your truck on a regular basis those bushings will start to change shape. When this happens your shackles could be loose and the leaf springs could shift and throw off the alignment of the axle and wheels. This can cause steering wander in a live front axle 4x4 or awkward thrust angle from a misaligned rear axle. Daystar's polyurethane bushings can correct all this. 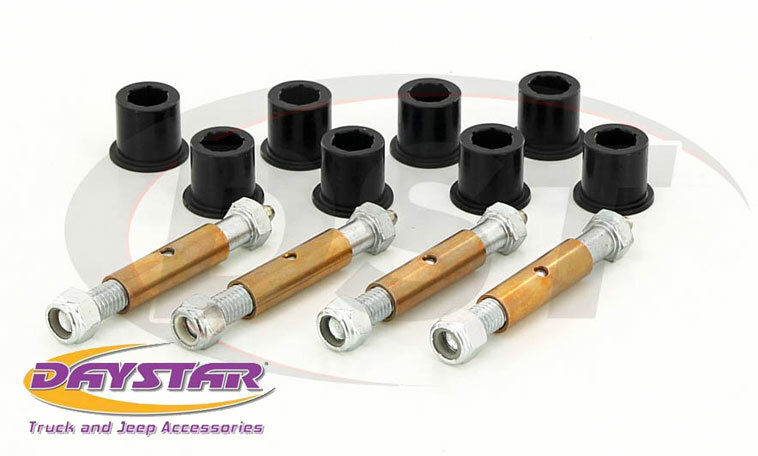 The polyurethane shackle bushings from Daystar are more durable than the original rubber bushings and can handle the shape-changing stress that your truck or SUV produces. Besides being more resistant to wear, poly bushings brush off the environmental factors that can degrade rubber, like road salts, motor chemicals, and road grime. If there is a downside to poly bushings it's that you will almost certainly notice more noise and vibration making it's way to the cab, since the connection between the suspension and the frame is firmer. In essence you're trading the absorption of rubber for the alignment-holding durability of polyurethane. Firmer bushings mean firmer springs, less body roll, and better handling from your vehicle. So check out Daystar's polyurethane bushings for leaf spring shackles and strengthen that weak spot in your SUV or truck.